Put on your bowlers lads, we're going to the UK today! Topps made a corporate decision in the 1950's to expand their product lines internationally, first reaching into Canada then later Venezuela in this hemisphere. 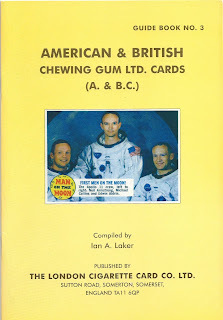 By the end of the decade they had set their sights on A&BC Chewing Gum of England and would further their quest into Holland, Israel, Australia & New Zealand by the early 60's. 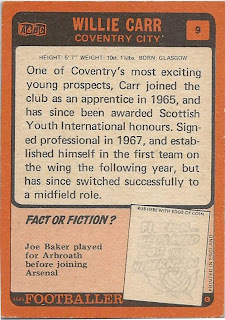 The Topps/A&BC alliance eventually became Topps UK in the mid 70's but used the A&BC brand exclusively before that. 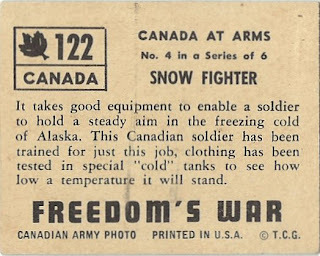 After World War 2 A&BC would be to kids in the UK what Topps was to the young 'uns in the US. 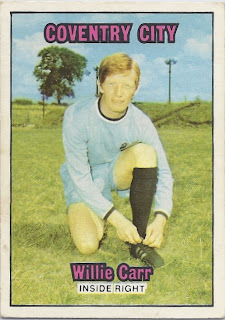 There is an excellent treatise on A&BC on Nigel's Webspace, which is also a megasite for "Footballer' cards issued in the UK. I didn't link to the article but it's at the links near the bottom of the page; it's more fun to explore his whole site anyway. My primary interest in A&BC and some of the other international Topps affiliated brands from the mid century goes well beyond just the footballers but today I just wanted to share a couple of nice looking cards. There will be much more on A&BC as we press forward this fall. That is a coin rub feature in the lower right corner, which is a byproduct of Topps' US baseball sets. Many designs on the overseas cards over the years were based upon stateside graphics, sometimes exactly so and there will be a comprehensive feature on such similar looking pasteboards soon. A&BC's first set of footballers was issued in 1958, around the time Topps affiliation with them commenced. 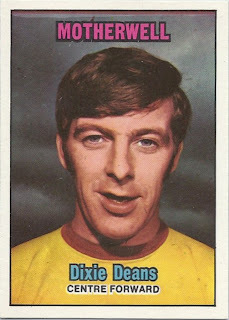 The cards featured players from the English Football League First Division, the major league version of soccer on the Isle. 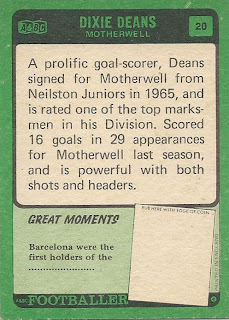 They expanded to a second set featuring Scottish Football League players in 1962 (a very rare set) and the Scottish cards were issued separately on an annual basis (in most years) into 1980 I believe. Those full bleed backs must really do a number on the mint freaks out there! 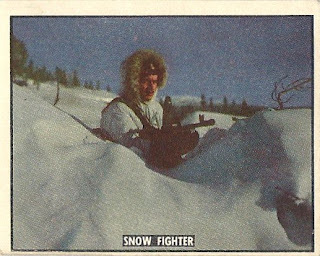 By the way, these UK cards measure the same as standard sized Topps cards of the same era, or about 64 mm x 89 mm. 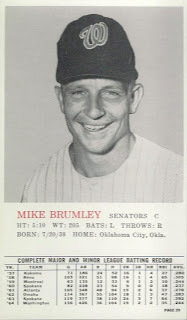 Not all cards are made equally however; there are some size variations with A&BC cards even on sets they replicated otherwise exactly from the US. 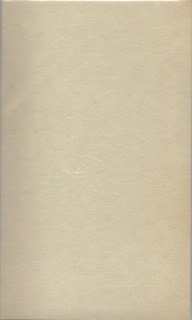 Like I said before, there will be more on A&BC (and other Topps concerns) around the world as the Archive goes global. There are test issues and short prints, mysteries and double prints just like in the US, so there's plenty to look at laddies! 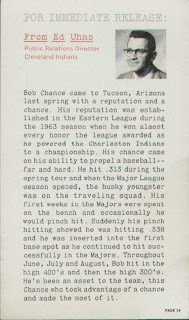 Well, it didn't take long for some better '64 Rookie Banquet scans to come winging my way across the mojo wire, courtesy of friend o'the archive Doug Goodman. Over the the first 50 or so years of Topps marketing cards there aren't many examples of legitimately released sets that were not issued in packs or sold in stores. 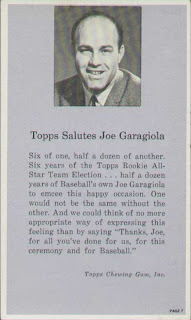 The 1970 Bowie Kuhn card comes to mind, as does the Joe Garagiola business card and the 1990 George HW Bush card (with a "maybe" on Pres. 41-some were rumored to have been inserted in packs) but there's not a wide range of possibilities. 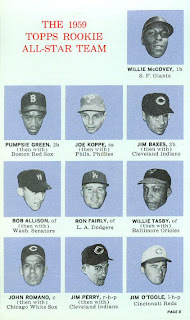 But Topps did manage to issue a fairly broad set in 1964 featuring the subjects of the current and past festivities held annually at the Waldorf-Astoria hotel in New York that is known today as the Rookie Banquet set. A little background is in order. 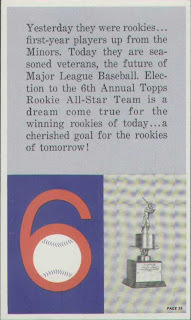 The first Rookie Banquet was held in 1959 to honor those ten lucky players chosen by a surprisingly well-rounded Election Committee for the Major League Baseball All Star Rookie Team. 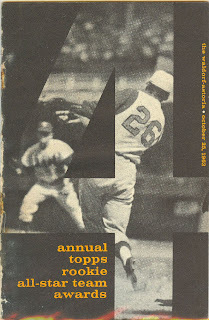 For the next seven years Topps issued a really nice program that was distributed to the formally attired attendees. 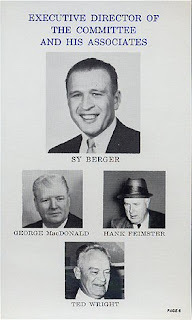 After the 1966 gathering the program was scaled back although I believe the banquet is still held to this day. 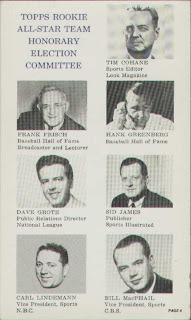 However, my mission today is not to discuss the programs (that will happen to be sure, just not now) but rather a permutation in 1964 that resulted in a scarce 36 card set full of esoteric and diverse subjects that actually was the program. The box is printed on semi-reflective foil and it looks pretty cool in the light.  Some very simple mid-60's design work was used, quite effectively I think. Yup, that would be his rookie card! 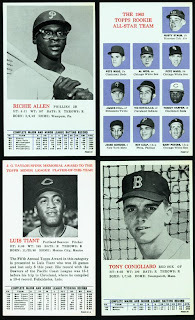 That Luis Tiant card is actually numbered 34A, which means the set stops at #35 (a picture of the trophy which I cannot find a scan of, alas) and not #36. 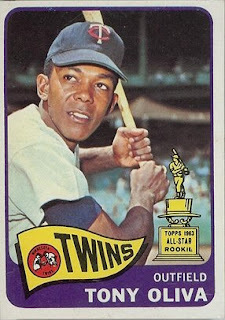 Luis was the Topps Minor League Player of the Year so his card looks a little different than the other 1964 winners. These cards are quite valuable and generally appear as singles nowadays as it seems many extant sets were broken up over the past two decades. I would estimate a 200-250 set print run on these guys but I get the impression there are no more than a three or four dozen sets or remnants thereof out there. Sets still do pop up from time-to-time though as old sportwriters move or pass away and their archives are cleaned out and auctioned. 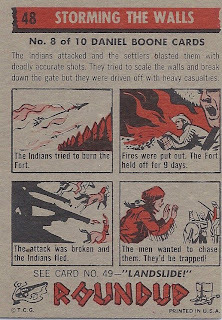 War cards were a big Topps staple in the early 1950's. World War 2 had ended a scant half a decade earlier and unbelievably yet another conflict, the Korean War, was raging. 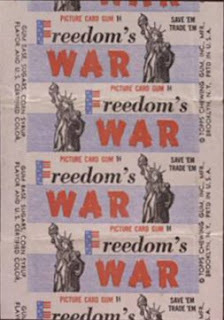 The boys in Brooklyn took advantage and issued a large set of cards called Freedom's War over a two year period from mid-1950 to mid-1952. I won't get into all the permutations here but there are card stock differences, single cards, two-card panels, three price points for packs, a series of die cut tanks that lost the cut and then were pulled completely, at least three separate printings and a bunch of other stuff I'll get into in a really long post someday. These are sized at 2 1/16" 2 5/8" which was a common size in use at the time. 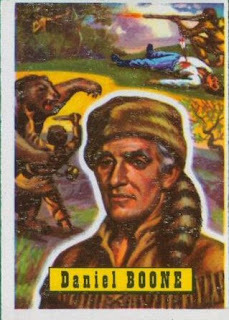 Topps was likely trying to up the patriotism quotient in their battle with Bowman, a company known for its staunch pro-government stance. Looks like the proverbial polar bear eating mashed potatoes in a snowstorm, doesn't it? That panel was once Woody Gelman's by the way. I would think these were part of the proofing process. 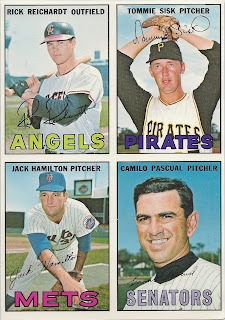 In later years (mid 70's) I know there are proof cards printed on ultra white cardboard but the process may not have been 100% refined in 1967 so Topps used high quality paper. I have seen a couple other 4 card panels like this over the years, so they are not exactly common. 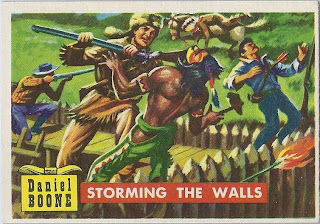 Topps issued a really nice set of 80 historically based cards in 1956 featuring tales of the American West paired with some stunning artwork and commonly referred to in the hobby as Roundup. The set is also historically significant in the Topps pantheon as they are the last of the large sized Golden age cards produced in the 1950's (2 5/8" x 3 3/4" in size). 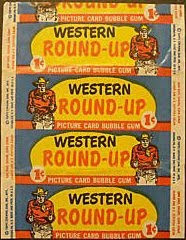 I suspect I nailed that scan from Ebay....The wrapper indicates the set is called Western Roundup but since most (but not all) Non Sports cards are identified by the name appearing on the card the lesser name has prevailed. Quite the history lesson on the back of these. That dead settler with an arrow through his heart is priceless! That is a pretty diverse group in that it includes an outlaw, a showman and assorted ne'er-do-wells instead of the usual parade of commonly accepted heroes. 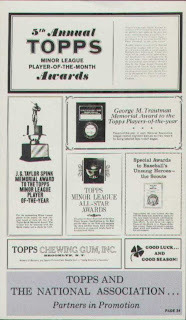 Today we have a three for one deal, which is appropriate as the discussion centers on a favorite business strategy of Topps in the golden days-the product dump. Starting in the early days of card production and running at least into the mid 80's, Topps would offer, on a seasonal basis, repackaged and bargain priced cards and assorted confections starting with Hallowe'en, then changing the mix at Christmas before coming out with something around Valentine's Day, the latter using a slightly different strategy which will be explored someday in further depth. 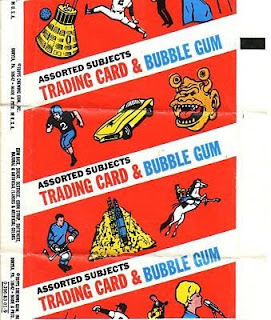 A "Gum & Fun Assortment" was one description used but these are commonly known in the hobby as "Fun Packs" or Fun Paks". Take a bunch of overstock, bag and/or box it with various types of gum and then push them as Hallowe'en treats or Christmastime Stocking Stuffers and you have all the makings of a Fun Pack. 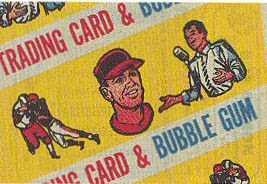 Many times (but not always) the cards sold within would be re-wrapped in a special wrapper that would generally hold between 1 and 4 cards. I believe in the earlier incarnations that ran through the 1960's that most of these held a single card and since they were sometimes marketed at 100 single card packs for $1, I consider them to be penny packs, at least for purposes of this discussion. 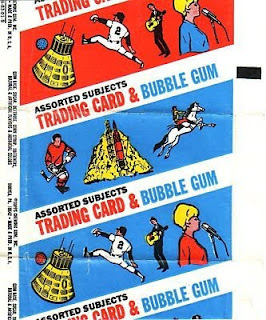 The red "Trading Card" wrapper is confirmed to be from 1965 but there is a credible story the Flash Gordon cards were sold or at least rewrapped in the red overwraps in 1968, so Topps may also have recycled some Fun Pack wrappers from year to year while utilizing a new design either each season or each year (another mystery to be divined as more information becomes available). I believe those were from an Ebay auction back a-ways now. Early Fun Pack Wrappers are not that easy to find and sealed packs are scarce. All I know is, I never once, in all my prime trick-or-treating years (which were from about 1966-72) received one of these among the wax bottles, Baby Ruth's or Smarties that were typical Hallowe'en fare at that time. 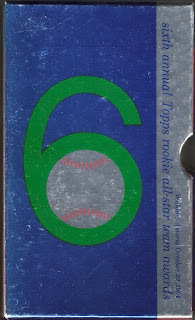 In addition to the mini theme of penny wrappers that will be weaving in and out of this blog, the other thing that has captured my attention lately is the way Topps would use certain design elements from one set in another set. Sometimes the sets involved are not all that common and it seems like Topps would save some effort by recycling a design. The basketball stickers feature all ten ABA teams and seventeen NBA franchises. 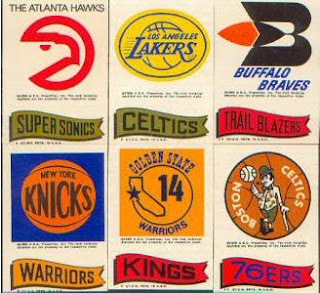 As there are 33 different stickers, some different combinations were created in the NBA run, with six variants possible (Hawks, Celtics, Braves, Warriors, Lakers, Knicks going by the main logo). The ABA run was static. My online buddy Jon has documented the basketball stickers and packaging at his Fleer Sticker site and I urge you to click on over there to take a gander. 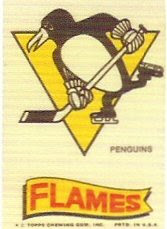 That is a 1974 Topps Hockey sticker insert (which came two per pack with yet another, different insert to boot). There are 18 NHL teams represented, plus a league logo, with five repeaters (Flames, Bruins, Canadiens, Rangers, Maple Leafs by the main logo). Those are real names and logos, just like the NBA stickers. 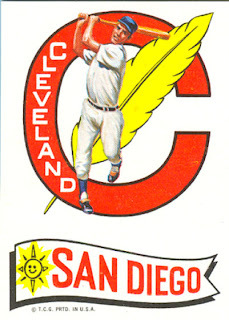 It would appear the Baseball Action Emblems (cloth version) came first in 1973 , then the NBA stickers came after later in '73, then a reissue of the Baseball Action Emblems (slick style) occurred in 1974 followed by the Hockey stickers later that year. That is a creative use of a design! I've decided to start a recurring feature here at the Archive I'm naming Penny Arcade, which will riff on Topps penny packs and wrappers. This is partly because I am pressed for time of late but also because I am obsessing over Topps One Cent Wrappers these days (none of which I own, by the way). Suppliers to Topps make profit on raw materials for cards and gum, etc. Wholesalers sell cards to local markets and stores. Stores sell cards to kids. All for a penny! Yes, I know the whole structure was based on bulk sales and marketing but it's amazing there was enough for all. Think about it- a 120 count box of penny packs retailed for $1.20!! Well enough Economics, on with the show. The Outer Limits was a sort of monster-themed version of The Twilight Zone by way of outer space that ran from 1963-65 and then lived on in reruns. Much like TZ, Outer Limits was resurrected years later in much less satisfying form. 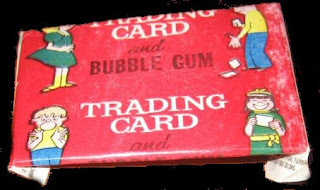 Today let's take a peek back in space-time at the penny wrapper from this 50 card set, which was issued by the Topps nom de plume Bubbles Inc. Pretty gruesome, eh? This one's a little dirty-the primary color is a garish green. The cards are tough to find in nice shape with full bleed fronts and backs making life difficult for the PSA crowd. 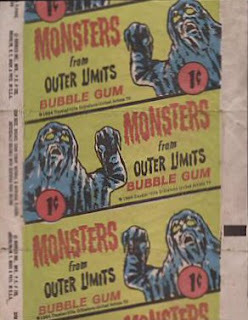 A really nice Outer Limits cards site can be found here and since I am focusing on the wrappers for this series, you can view the cards quite easily offsite.